Day Five started with me waking up just after 5:00 a.m. While I felt rested, I was rather annoyed that I still had not adjusted to the time-zone change. I decided to get up and edit my photos, but keep quiet so Ronald could sleep in. I noticed Ronald was a wee bit tired yesterday, and hoped he could sleep until 7:00. However, at 5:45, Ronald used the washroom, so that didn’t work. We were both up and about by 6:15. We decided to have breakfast at the Three Bears Restaurants since we had $2.00-off coupons. It turned out to be a lovely breakfast, and we left feeling refreshed. I guess at $170 for one night, the beds should be comfortable! We consulted our maps and the GPS, and mapped out our route for the day. 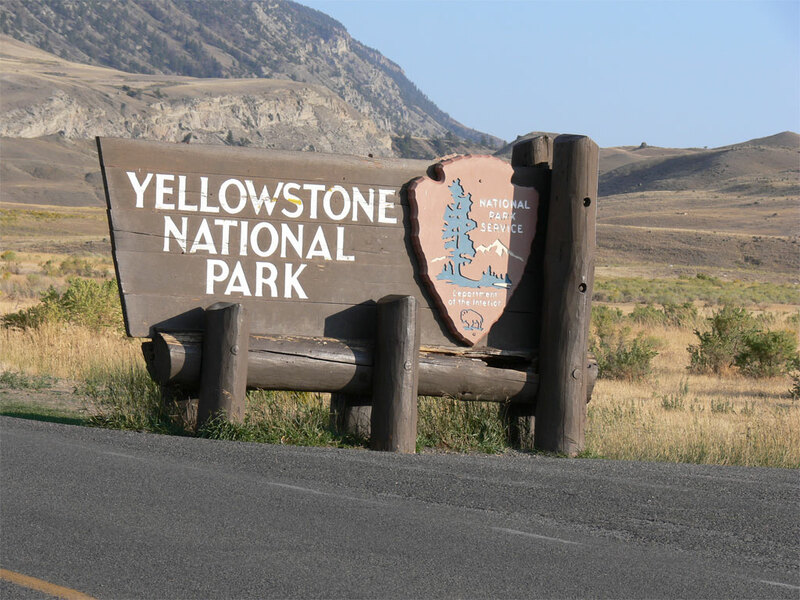 We entered Yellowstone again and showed them are park pass, which made things very simple. On the way over, we stopped to take pictures of a deer, a waterfall, and some buffalo. We also stopped at a steaming spring. The sound of the escaping steam was very loud, and there was a great quantity of steam. We walked on a plastic board walk, and I shot some video in order to record the sound of the steam. Just as we were leaving, a whole troupe of Chinese tourists came, and I spoke to one of them. He turned out to be the leader of the group. 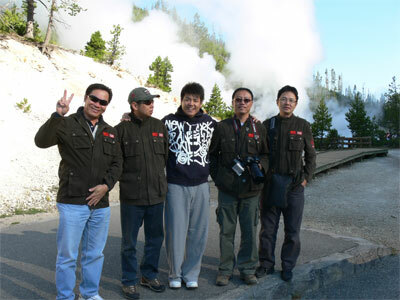 They were part of 200 people in a tour group who belong to an adventure club based in China. They all seemed to be under 30 years of age, and each one had a very high-power camera. I gave him my business card, and they took lots pictures of us and a video of us, and then we carried on. You can’t beat the Orientals for their photography gear! Along the way, we stopped to take a picture of a bison right beside the road. After my first shot, the bison headed into the woods. Our first stop was the information office near Canyon Village. It took us close to an hour just to run from our hotel to get there. 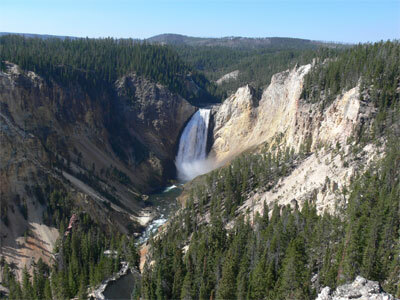 The one thing that impresses me about Yellowstone is the sheer size of it. It seems more like a driving holiday than a visit to a park. We spent most of our time going from point to point. At one time, Ronald asked me if we were still in the park. And, yes, we were, but we’d been driving for an hour by that point. 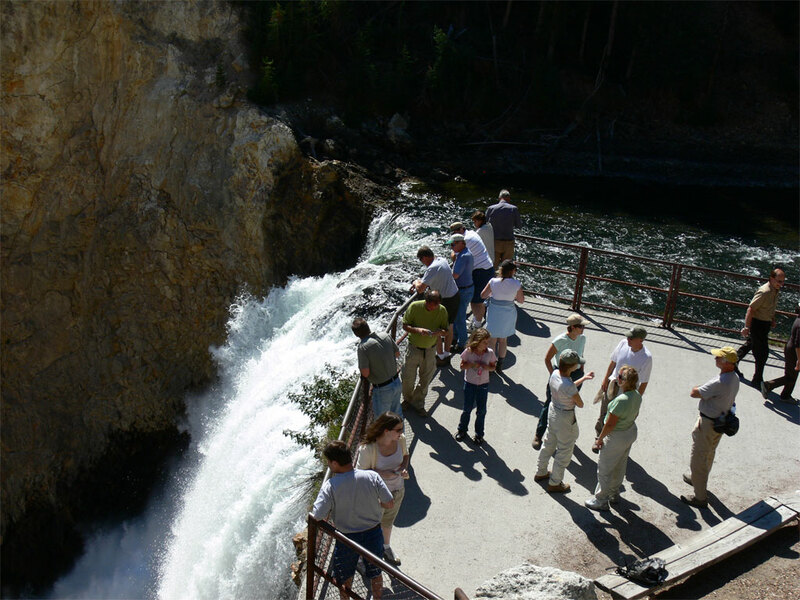 The staff at the visitor centre was very helpful, and we picked up two points-of-interest maps for 50¢ each, and headed about a mile south to the lower falls. Yellowstone Park. With over 1500 deep canyons, it is easy to see why. At the first observation point, I brought out the tripod and got some good long-distance pictures of the far side of the canyon. Ronald and I took turns sitting on some tree branches right at the precipice with a 1000-foot drop behind us. Lots of fun! We also got in the habit of asking the many photographers around us if they wouldn’t mind taking a picture of the both of us standing near the edge with the canyon in the background. We would then return the favour and take a picture of them. It seemed people were delighted to be able to co-operate in this way. It makes you wonder why more people don’t help each other out in the same way? park Rangers screamed in and headed to an apparent stroke victim. One pass was closed as they attended to this person. 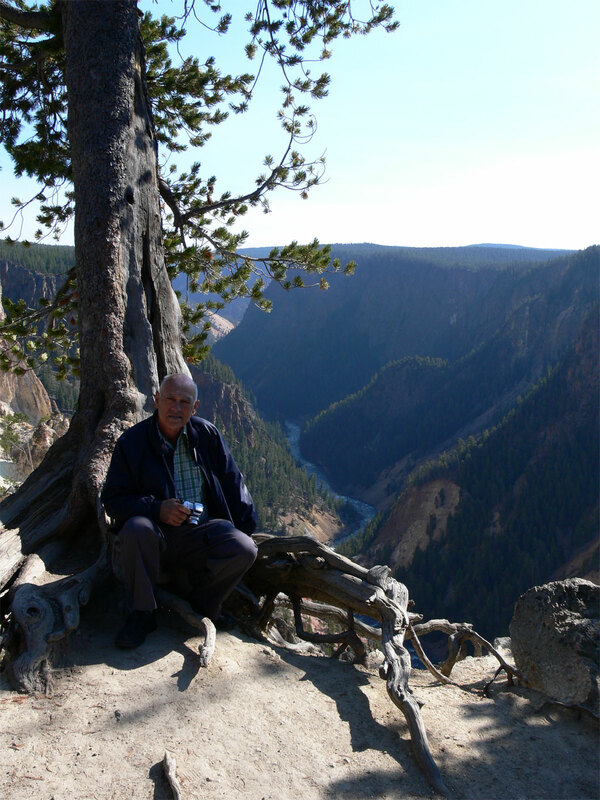 Ronald decided not to take the steep path down to the brink of the falls, so we agreed to meet 45 minutes later at the car. 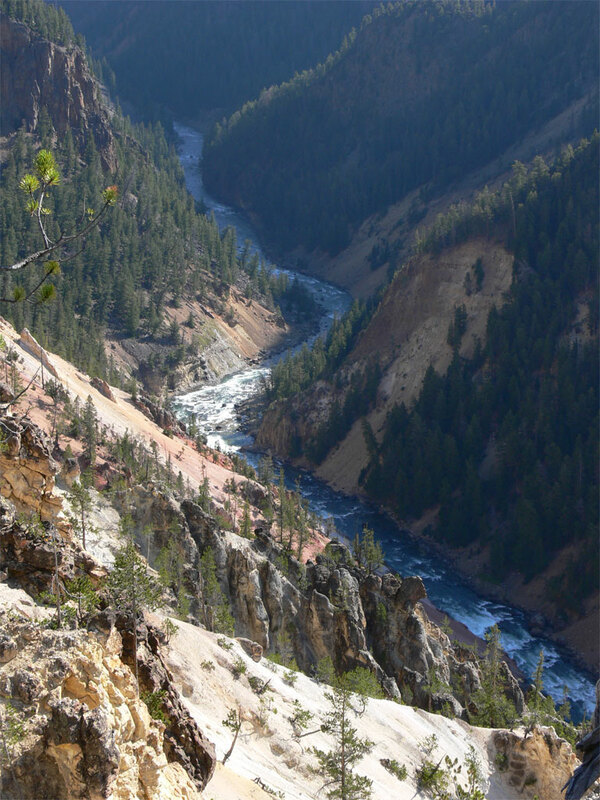 I changed into my shorts, brought along some water, and headed down the trail, which zigzagged back and forth across the canyon wall all the way down to the falls. Going down wasn’t too bad, although it was a steep incline the entire way. handy. Ronald told me, “Just wait till you see the Grand Canyon.” However, I have to say I’m already impressed! The hike back up the canyon wall made me realize that I’m really getting out of shape. They had plenty of benches along the way to sit down on, and I forgot my pride, and just sat down, huffing and puffing. We would joke with the other hikers saying that we were just taking in the view! The next stop was the upper falls, which is a 130-foot drop. The hike down to the brink of the falls was only about a five-minute hike, but that view was still quite good. I must say, though, that it didn’t compare with the 300-foot falls. Around noon, we headed back up to the information centre, and stopped for lunch. We were not particularly hungry, so we just stopped into the general store and picked up a three submarine sandwiches and some milk. I like the strawberry milk, and Ronald loves the Hershey chocolate milk. On the way in, we met a fellow on a bicycle. He had all kinds of bags everywhere on his bicycle, including a solar panel over the rear bags. Ronald got talking with him, and it turned out he been on the road for two years. He seemed very well equipped, although he didn’t look particularly well off. Unfortunately, we left the camera in the car. He said he’d been doing various trips since he was a teenager. This was his fourth trip around the West Coast. hike to the Tower Falls, which turned out to be the least impressive of the three different falls we saw. However, to get there, we had to go way up the mountain and then down the other side. Ronald's ears had trouble adjusting, so we stopped at a store and bought some chewing gum, which helped a lot. Again, I was impressed at the sheer size of this park, including the large mountains. At one spot, we came across the sign that said we were crossing the continental divide at 8300 feet. Ronald said he could sense the difference in the atmosphere on his breathing, but I wasn’t able to detect the same. However, I do know our sleep in west Yellowstone was very good, which may have had to do with the higher altitude. 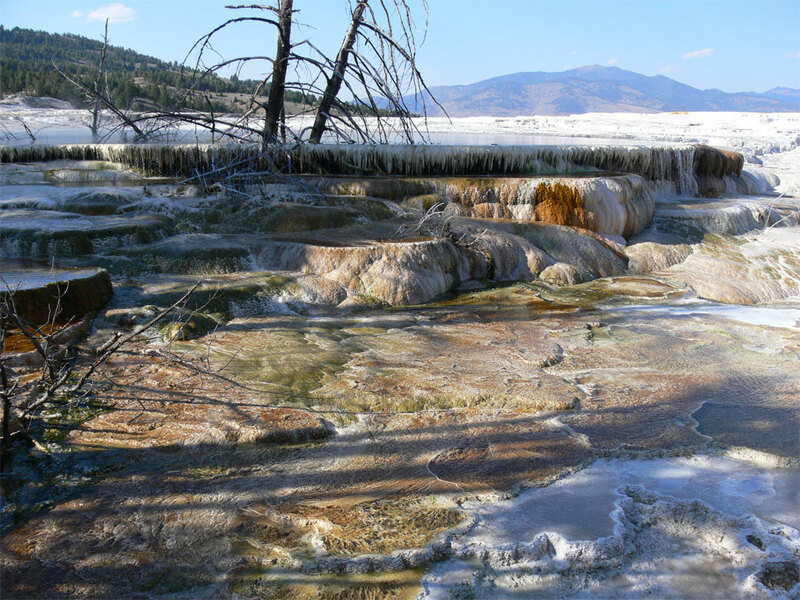 Next, we headed west across the top of the park’s Mammoth Springs. At one point, we saw a car stopped, with people running onto the shoulder area with their cameras. I was able to spot a coyote about 3000 yards away. As we came down the mountainsides, we also saw various bison far below on the plains. Overall, it doesn't seem this area gets a lot of rain, and there's a lot of sparse grassland dotted with sagebrush. 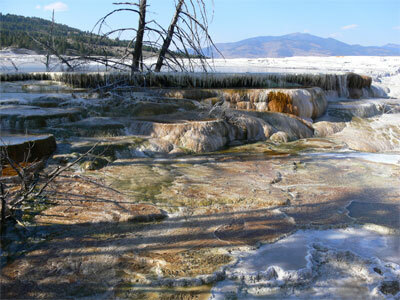 When we arrived at the Mammoth Springs, we stopped at the first designated spring. As soon as we got out of the car, I noticed a female elk crossing the road. 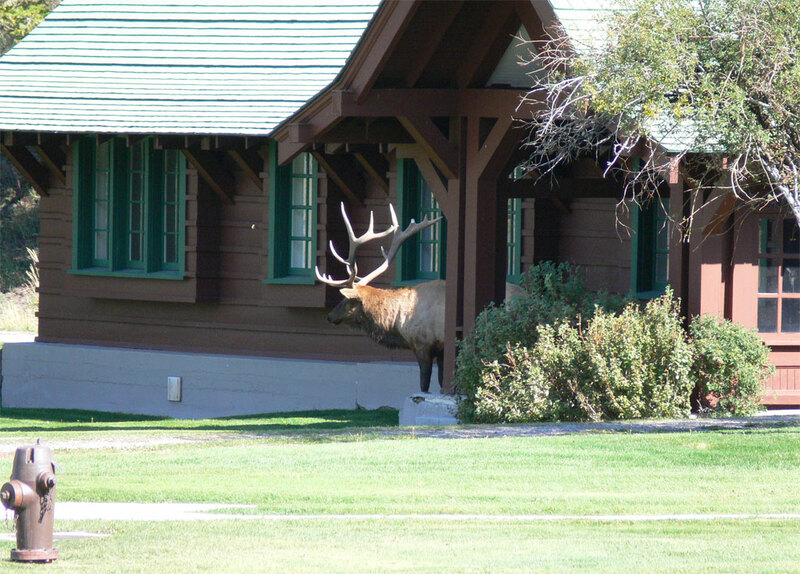 We forgot about the springs and started taking pictures of the elk. I noticed a park ranger with a vest on, keeping the public back. 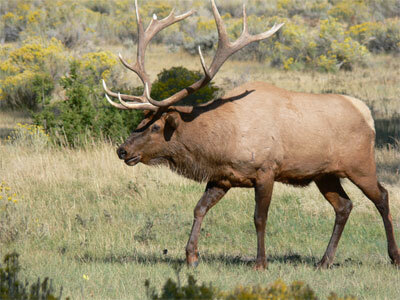 It turned out to be a whole herd of elk, including a large bull with a full rack of antlers. 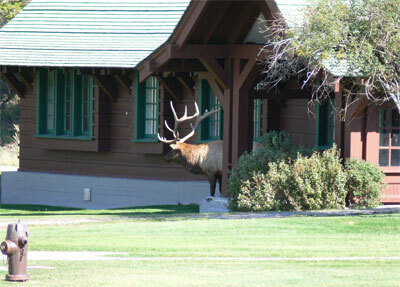 At one, point the bull was standing on the front porch of a local house, while the females grazing on the manicured lawn. 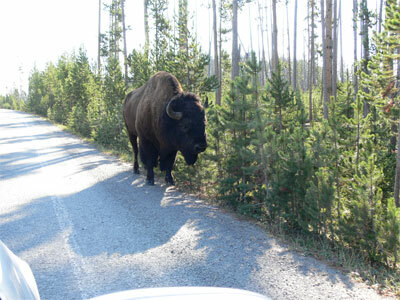 The rangers said the bull was doing a terrible job of herding his females, and they walked right past the parking lot and across the road. I was able to get quite a few shots. be a magpie. It had a real loud, irritating call, but was very pretty to see. The tail seems to be twice as long as that of any other bird. We then went down to the next parking lot, as this particular spring had dried up. We got to an area where the whole side of the hill looked to be covered in limestone. We got out, and started to climb up the board walk, which included a lot of stairs. It turned out that the spring had dried up, and the terrace area was all dry and white in colour. We got towards the top, and a lady said that the Canary Springs at the far end of the trail were spectacular. However, it was at a dead end, so we went back to the car and drove around to the top of the hill. On the way up, we noticed another small herd of elk, and I got a few more good pictures of the bull. This time, we were very impressed with the various colors of the hot spring. The underlying rocks were limestone, and it created all kinds of terraces and hanging stalactites as it went over small waterfalls. I fired a great many photographs, and I was really impressed with how beautiful it was. There was a lady standing next to me, and again we recruited her to take a picture of Ronald and me. I could tell she was just in awe of the landscape. I particularly liked the lower part of Canary Springs as there were coral-like formations in the water. Some of the more stagnant pools looked like ice. This was certainly a worthwhile stop. p.m., we decided we should stop for supper. After looking at rather expensive restaurants in a first class hotel, we ended up in a little cafeteria and grabbed a hamburger. 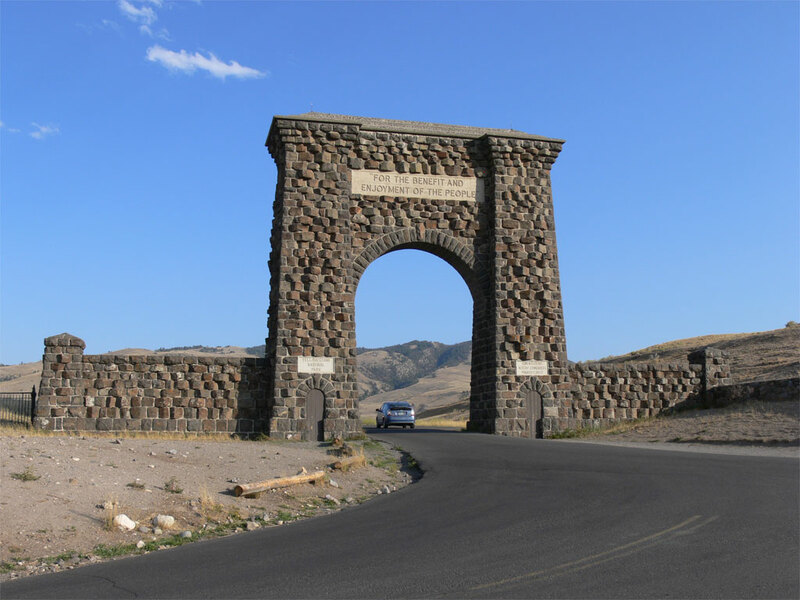 Then we headed north, and crossed the border of the park around 6:00 p.m.
Just as we exited the park, we came to a huge stone arc about 60 feet tall. 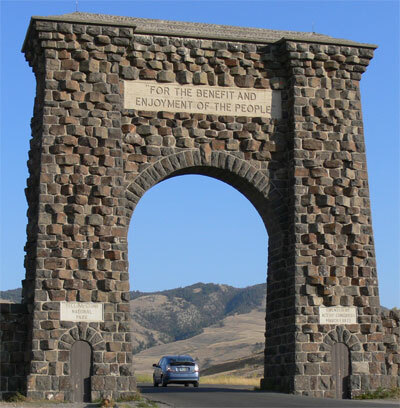 Engraved on it were the words, “For the enjoyment of the people.” I believe it was President Roosevelt, whose face was on Mount Rushmore, who established Yellowstone Park. 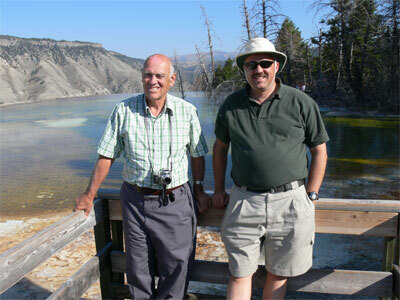 Yellowstone was the first of all the national parks, and I think it must be the show-piece of America. It does leave you impressed with the vision and foresight that some of these early Americans had in creating such a nature preserve. out she had sent me some emails, but they hadn't come through until I got signal. We ended up staying in a little bed and breakfast called Querencia. The owner, Joe, was able to give me the exact address, which a plugged into the GPS, and we went straight there. While the driving was a little bit difficult to negotiate, as the side roads were not on GPS, we got there without too much difficulty around 7:00 p.m. When we asked if he took MasterCard, he said no, he only took cash, which we found a little bit odd. Our impression of the bed and breakfast is that his wife established it. However, he was divorced in 2000, and was trying to run it on his own with the help of his son. He now no longer offers breakfast, which again was rather strange. I also found that the bed had about a 5-degree slant on it, and did not make for good sleeping. When I went to have a shower, I had to borrow Ronald’s soap, as there was no bar soap in the washroom. However Joe was helpful in helping us locate an art gallery that may have been the one that mom had been dealing with. We drove about a mile down the road, and found the Moose Horn Gallery, which was very impressive. As it turned out, this was not the Great Artists of the Earth Gallery that mom had been looking for. However, it was a very good art gallery, and we may have found a valuable contact for the future. I took a ton of photos, and had a very pleasant conversation with the sales lady. We got back to the bed and breakfast around 8:00 p.m., and I dumped both memory cards into my computer. Ronald had taken 62 photos that day, and I had taken 302. I must say that Ronald is becoming a very good photographer, and his photos have turned out really well. He has learned to use the tripod and the delayed shot in order to get good long distance shots. However, I was still having trouble getting on the Internet with my computer. The son was very gracious and invited me up to use his computer to plug my V-Phone in. I was able to call mom and dad and fill them in on our investigation into the art gallery. He also did some Google searches for us, but nothing came up about the lady mom had been dealing with. After I had a shower, we both went to bed. However, it seemed that the heat was turned up a bit too high, and the bed was rather narrow and uncomfortable. We tossed and turned most of the night. I ended up sleeping in until about 7:00 a.m., which is rather unusual for me. We had traveled 205 km on our fifth day. Tomorrow is a travel day, with us heading north to the Canadian border to see Banff. Onward Ho!